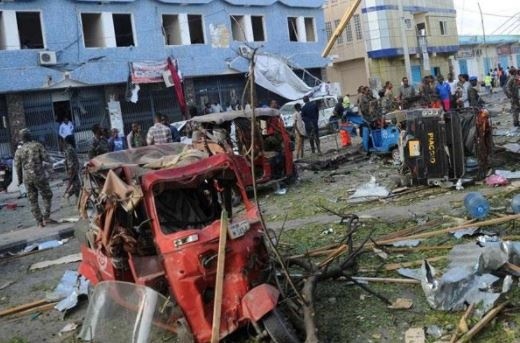 17 people were killed and eight others injured in an explosion on Thursday outside a popular hotel in Somalia’s capital Mogadishu. A spokesman for the Ministry of Internal Security, Abdiaziz Ali Ibrahim, told the media that the wounded were being treated at the city’s hospitals. “17 people died including a young girl, some workers and persons having tea at roadside teashops popularly known as bibiito,” said Mr Ibrahim. He said a tricycle taxi, locally known as bajaaj, may have been used for the explosion. The blast occurred opposite one of Mogadishu’s oldest lodges, the Weheliye Hotel, along the busy Maka al-Mukarrama Avenue. The jihadist Al-Shabaab group claimed responsibility. The group carries out frequent attacks in Mogadishu as it seeks to overthrow the internationally recognised Somali government.